Someone paid base 911 Carrera money just to get this paint job. Paint-to-sample is one of our favorite options on any Porsche model. This option allows owners to have their car painted in basically any color they want. If the list of standard colors aren't brash enough, the owner can simply send Porsche a sample of whatever color they want and have the company recreate it. Some of our favorite Porsche colors are only available as PTS, and we've recently seen one that really stood out. The color is called Python Green, and it may be one of the most expensive paint jobs that we have ever seen. This unique green was ordered as a PTS option on a 991.2 911 Turbo S. The photos were taken by @minimaldigital on Instagram, showing off this incredible color. The car was reportedly used as a show vehicle for the AvD Oldtimer Grand Prix at the Nurburgring. Python Green is one of only five "Chromaflair " paint jobs that Porsche makes each year. There are also blue, gold and violet examples that have been produced this year. This paint is extremely difficult to make. Porsche uses magnets to align the flakes after each paint coat. This particular color requires nine coats of paint and three clear coats. So what is the cost for this amazing paint job? Try 82,645 Euros. That is about $97,689. To put that into perspective, a base 911 Carrera will run you about $89,000. We don't know if we would ever spend that kind of money on a paint job, but its hard to argue with how unique it is. 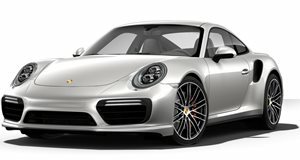 This green 911 Turbo S may not have the power boost that was recently given to the gold Exclusive Series, but that car will have 500 examples whereas this car will be one of a kind.